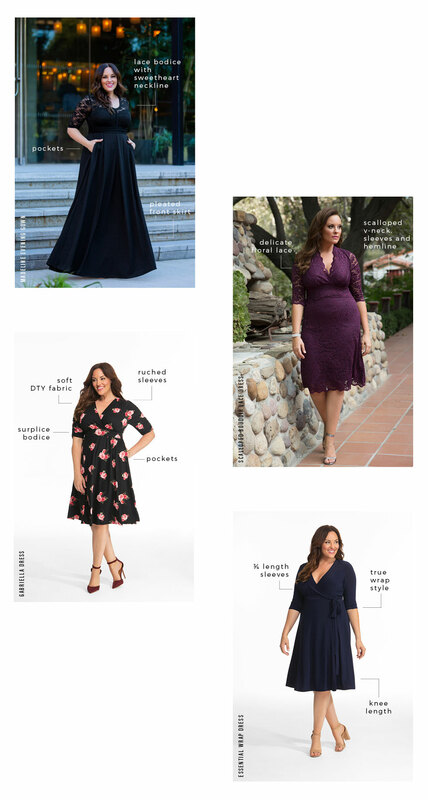 If you’ve recently received a wedding invitation in the mail, you’ve probably already begun your online search for plus size dresses for wedding guests. Finding the right dress that flatters your curves takes time and planning. After all, there will be photos of you with the bride and groom and maybe even candids on the dance floor. Weddings are a special occasion, and therefore require a special dress that makes you look and feel your absolute best. So, if you’re wondering what to wear to an upcoming wedding, we’ve got some great styles for you to consider. One of our all-time favorite lace dresses for wedding guests is our Scalloped Boudoir Lace Dress. This curve-flattering cocktail dress is designed with a stretch floral lace that moves with you and feels comfortable for all-day wear. A scalloped V-neck, sleeves and hemline add a dainty, feminine touch. An empire waist complements your silhouette effortlessly. With a few different colorways to choose from, you’re sure to find the right color for your upcoming wedding. Another great classic style that is perfect for weddings or any special occasion is our Essential Wrap Dress. This timeless wrap dress is one of those styles every woman should own. Princess seams along the front and back of the dress offer a fabulous fit that is both flattering and slimming. A longer tie allows you to adjust it for comfort and comes handy if you’re in between sizes. ¾ length sleeves and a knee-length add a touch of modesty that makes it versatile for other occasions. Choose from any of our exclusive prints or shop this dress in classic black or navy. This year, our Gabriella Dress made a splash as one of our most sought after dresses for wedding guests. There are many reasons why we love this dress and recommend it to everyone. Designed with a soft DTY fabric, this retro-inspired dress is timeless and ideal for any season. An A-line silhouette, surplice bodice, and ruched sleeves flatter every body type. As a plus, this already great dress is also designed with pockets! Available in a variety of floral prints and bordeux, it might be hard to choose just one. If you are a mother-of-the-bride (or groom) looking for a gown to wear to the wedding, you’ll find plenty of options for the big day. Our new Madeline Evening Gown is a style you have to consider wearing. This elegant dress was made to be shown off at a special occasion. Designed with a lace bodice, sweetheart neckline and crisp, pleated skirt, you’ll love how you feel in this evening gown. A ruched waistband is flattering and adds definition. And, as if this dress wasn’t already gorgeous, it’s also designed with pockets. This style is also perfect for Black tie weddings, if you’re shopping as a guest. Regardless of the type of wedding you’re attenting, you can always count on Kiyonna to have the best dresses for wedding guests. Whether you’re shopping for a dress with lace or tend to gravitate toward a classic wrap dress, you’ll find styles that will have you photo-ready for that upcoming RSVP.